My Requirements and Purchase Decision. 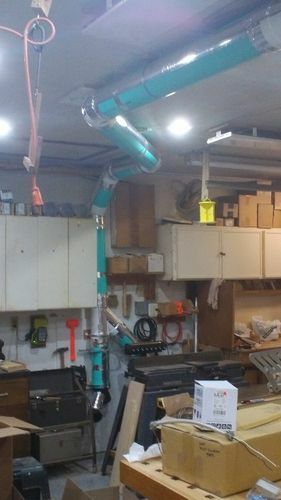 I used a ½ hp dust collector with an awful filter bag for about 10 years before I outfitted it with a shop made cyclone from the “ShopNotes” design in 1998. I used that machine up until August 2015, when I purchased the Clearvue CV 1800 cyclone bundle. It was a shop upgrade long overdue, but probably like many woodworkers, I would rather spend money on wood cutting tools than on a vacuum cleaner. My decision to upgrade dust collection occurred earlier in the year, after which I began researching the purchase. I read three dust collections books, viewed Youtube videos, and read countless articles and reviews until I was sick of dust collection. I was quickly able to eliminate dust collectors that were not equipped with a cyclone. I also concluded that cyclones with a short funnels were only marginally effective in separating fine dust from course dust, so I eliminated these. It left four choices, Grizzly, Oneida, Penn State Industries, and Clearvue. All these companies’ websites were informative and complete. I doubt that I would have gone wrong purchasing from any of these contenders. Two of my constraints were size and power consumption. I pursue woodworking as a hobby, working alone in a two car attached garage packed with machinery. The entire dust collector had to fit under a ceiling that is 101” high and had to fit over a footprint of less than 34” deep and less than 60” wide. Important considerations for me were 1) A Minimum of 800 Cubic Feet per Minute air flow at a high static pressure, 2) A Long cyclone funnel that tapered to a narrow outlet, 3) The footprint and height, 4) Maximized dust bin capacity, to avoid frequent trips to the compost pile, 5) The filter’s ability to remove very small dust particles, and 6) Noise level. I elected to purchase the CV 1800 bundle, because it satisfied all of my criteria except noise. It is very loud. I recall unabated noise levels reported in the range 90 decibels up to 105 decibels. A major plus with the CV 1800 is that, in addition to very good filtering performance, there is 300 square feet of filter area while others offered 1/3 of this surface area. I purchased the CV 1800 Bundle when it was on sale and the sale price included shipping. Receipt. The CV 1800 arrived within a week or so of the purchase, including the Leeson 5 hp motor and the two Wynn Environment Filters (both shipped from locations other than Clearvue). All components were well packaged in several boxes and nothing was damaged. The motor was by far the heaviest box. The PETG plastic cyclone body and impeller housing were light weight. When I placed the telephone order, the sales agent provided me with her name and contact information with instructions to contact her in the event I had any problems receiving the parts. She also advised that all Clearvue employees are cross trained and also provide technical support during the assembly process. The CV 1800 bundle included the CV 1800 unit (including the Cyclone Body, Impeller, Impeller Housing and two Filters), Fine Dust Collection Cleanout Box, Electric Control Box with remote, and Hanging Brackets. Assembly. One problem some may have with the CV 1800 is the extensive required assembly. All parts must be put together and sealed (with the exception of the PETG plastic components themselves). The cyclone unit itself is a combination of 3/4” MDF and PETG plastic married to one another by the customer. The MDF was accurately machined to accept the PETG plastic bodies and provided fasteners. The MDF was painted blue and the painting was well done. After assembly, all joints had to be sealed with silicone. One tube of silicone was sufficient. The CV 1800 came without a main Dust Collection Bin. I purchased a fiber transport drum from Grainger and picked it up at a store (to save shipping costs). I am retired but my Grandson spends 4 days a week with me. August is harvest time, and life otherwise happens. With these interruptions, I had the CV 1800 assembled and setting in its shop built enclosure in a month. I figure I could have assembled the enclosure and cyclone in 7 – 10 days without interruption. This length of assembly time would have been perhaps a day or two had I not built an enclosure and made modification to the Impeller Housing Transition; but simply mounted the unit to the wall with the Hanging Brackets. The enclosure is a shop designed and built tower made from 2×3 construction lumber and ½” plywood. The enclosure is on casters (so the unit can be moved for service and any future repairs), and houses the Dust Collection Bin, the Cyclone Body, Impeller Housing, and Motor. The Impeller Housing Transition was lengthened so that the Filter Stack could set outside but next to the enclosure. The upper section of the enclosure is packed with denim sound abating insulation. The lower section is a sealed Dust Collection Chamber with a door. The Dust Collection Bin sets in the Dust Collection Chamber. The Dust Collection Bin is emptied by opening the Dust Collection Chamber door, sliding out the fiber Dust Collection Bin and then back into place. Clearvue instructed that silicone be used to seal 1) the joint at transition from the Impeller Housing Transition to the top Filter, 2) the joint of the two Filters (secured by an included band clamp), and 3) the joint where the bottom Filter meets the Fine Dust Cleanout Box. I did not use silicone, electing to use 1” wide flat felt weather stripping to seal these joints. At some point the Filter Stack will have to be disassembled for cleaning with compressed air. If adequate seals could be achieved at these joints with weather stripping, cleaning filters would be much easier and faster. So far these joints appear to be adequately sealed with the weather stripping. Problems. 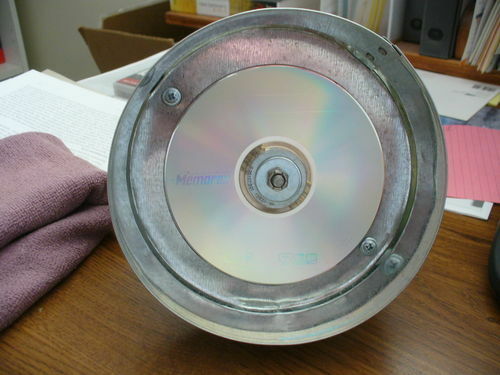 The impeller was mounted to the motor shaft. To do this I purchased a level arm torque wrench, required when attaching the impeller to the motor shaft using the included Baldor Taper Lock. I wanted to make sure the Taper Lock was installed correctly and according to manufacturer’s torque specifications, hoping to avoid a hunk of steel spinning at 3200 rpm ever rocketing through the shop. While installing the Taper lock, I used an imperial allen wrench when securing the three Taper Lock lifting screws. I suspect that I damaged the end of one of the lifting screws by using an imperial allen wrench. This could have been avoided by checking the fit of the allen wrench before tightening the lifting screw. I used an imperial rather than metric allen wrench because wrench sizes in the instructions were given for imperial wrenches and the imperial wrench seemed to fit. The only problem this may pose is if the impeller ever has to be removed from the motor shaft. Hopefully that will never be the case – but then even Leeson motors can go bad. Notwithstanding my comment regarding instructions below, the instructions for making electrical connections were clear. However, it took several false wiring starts before I had made the connections at the motor correctly. After finding the L1, L2, etc. labeling printed on the motor wires, I was fine. I did not see anywhere in the Clearvue instructions that the motor wire labels referred to in the instructions were actually printed on the motor wires. Perhaps this is standard, but then I do not wire motors every day. I found the instructions somewhat difficult to follow. They lacked the detail I seem to need when putting things together. However, when I encountered a problem, the Clearvue technician responded promptly, often the same day. I asked most questions by email. Others may find the instructions perfectly fine. Since I had no problems with the product, I can only comment on customer service related to help during assembly. It was excellent. Not really a problem, but something to point out: the CV 1800 did not come with cabling or a 240 volt 10 gauge cabling to make the connection of the Electric Control Box to power. Clearvue appeared to anticipate a direct connection to power. I elected to make this connection with a cord and plug. That was perhaps another $60 to $80. The cord and plug connection makes more sense to me, should the unit ever have to be removed for service. All other cabling was included. Performance. The CV 1800 is a screaming (double meaning intended) cyclone dust collector. It is both a loud machine and one that has a great deal of dust collecting power. 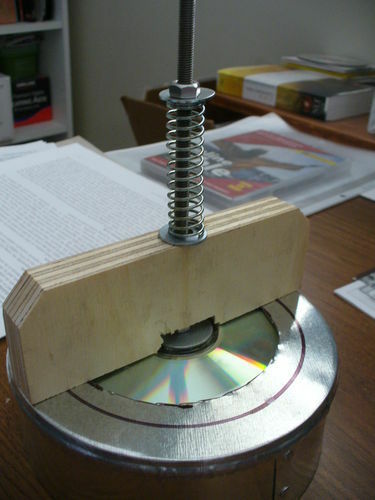 The impeller is well balanced resulting in impressively little vibration. Chips and dust are effectively collected at machines. The Pitot tube I constructed and installed at the Impeller Housing Transition continues to show like-new air flow, and little (almost no) dust is in the Fine Dust Collection Bin. While only 80 gallons of dust and chips have been collected thus far, the cyclone seems very effective in separating wood dust and chips. I was able to tame the noise level by including sound abating insulation in the enclosure, sound abating panels around the motor (leaving air vent channels), and applying sound deadening insulation on the walls in the corner where the machine sets. These efforts reduce noise so that the CV 1800 can barely be heard in the house and is far quieter than the table saw, jointer, and planer. It was only in the last two weeks that I have come to appreciate the power of the CV 1800. After completing the assembly of the unit, I had 60 feet of duct work to run. 6” SDR-35 Sewer and Drain Pipe and fittings were installed to pick up dust at my various machines (9 drops in all). Running duct work took about 3 calendar months. Also 3 machine ports were modified and a radial arm saw and jointer dust ports were fabricated. The difference the CV 1800 has had over the replaced ½ hp system is like the difference of night and day. The shop is a whole lot clearer and very little, if any, dust floats around in the air. At any rate, that thin layer of dust that previously covered all shop surfaces no longer exists and there is far less cleanup after milling. Would I do it again? Yes. It was a lot of work and a lot of money, but I expect to enjoy years of a cleaner and healthier shop. Very good review…thanks. it will help as I consider an upgrade to my dust collection. Good review, but I like and use Laguna and reccomend their product. Thanks for the review. I am shopping for a DC upgrade. I just need a physically smaller unit to fit in the shop. Assembly sounds like a nightmare. And MDF components? Not so sure I like that idea, but hey if it works it works. Thank you for your kind words. Regarding your recommendation of Laguna products, I agree. Last year I purchased their 3 hp compact shaper, part of my major shop upgrade program. Although I have only made one project using the Laguna Shaper, I believe that it met all of my requirements and am impressed by its fit and finish, its features, and performance. Before spending the kind of money we woodworkers spend, I suspect most of us identify our requirements and then look for tools that meet those requires and offer a good value. This is why I find these tool reviews and comments such as yours so helpful. In the end a tool that meets one woodworker’s needs may not meet those of another and thus result in differing purchase decisions. I have no doubt that Laguna produces quality well performing dust collectors. Some features of their dust collectors are: 1) they are compact in size, 2) offer dust collectors with plenty of power, 3) provide good fine dust filtration, 4) appear to be of heavy duty construction, 5) and are competitively priced, with special promotions from time to time. One of the factors that played heavy in my CV 1800 decision was the extent to which each dust collector removed fine dust before entering the filter. Since I could not find definitive specifications from most manufactures showing the amount of dust that makes it into the filter, I concluded that longer cyclone funnels were better in preventing fine dust from enter the filters. However, these longer cyclone funnels increase static pressure within the unit and adversely impact performance. Therefore a longer funnel requires more power to compensate for the increase in static pressure; more horsepower and more money that can be spent elsewhere. On the other hand, Laguna and many other manufacturers include either a manual or automatic filter cleaning mechanism. These mechanisms have the advantage of easy filter cleaning, though I am not sure how effective they are. Also, I would be concerned about premature damage to the filter. But then, in a hobby workshop, probably not enough damage to really matter. Man, I really do not like sorting through all the options manufacturers provide. I get a headache every time. 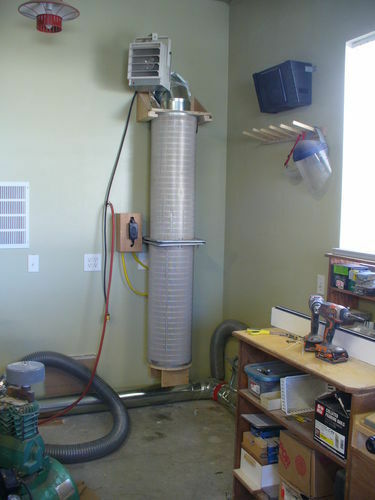 In summary, I respect your opinion concerning the Laguna dust collector, especially since it meets your dust collection requirements– evidently quite well; and based on my limited experience with Laguna. Lastly, I ran across this YouTube video entitled “Laguna Tools 2 HP Mobile Cyclone Dust Collector Review – Part 3” by Marty Backe at “https://www.youtube.com/watch?v=a37WkDGa6qQ”. It showcases one example of Laguna’s superior customer service. Yes I know from what I have read, some may argue that Laguna has awful customer service or this example is not typical. Nonetheless and for whatever reason Laguna demonstrated impressive customer service in this example – and any new dust collector will likely require some sealing here and there. I might have thought that assembling the CV 1800, the way I did it anyway, was a nightmare at the time. It was a lot of work, no doubt. However the nightmare was installing the duct work. That was a real nightmare. As far as MDF construction, I am not particularly concerned about it holding up. Apparently there was a time when the MDF components were not painted. In never ending humid environments like along the Gulf Coast, the naked MDF eventually began to deteriorate, as unprotected MDF can in constant moisture. The paint offers a level of protection that will probably last. Since I am in the mid-west where humidity comes and goes, I expect no problems with the MDF. While the disadvantage of the CV 1800 is the extensive required assembly, it is relatively easy work. The components are light weight, especially when compared to the heavy steel models. I completed assembly with no help. For the price and performance, it is competitively priced, probably due in part to the materials from which it is constructed. How well will it last? From what I have determined, probably fairly well but only time will tell. Outstanding review. I too, have recently added a cyclone and metal ducting system. Will write formal review soon. The difference is just as you stated – night vs day. What were we thinking all those years of not using proper dust collection? Personally, I believe, it is probably due to age and income – as we age, during our work years, we earn more money and can think about spending more money on our hobby. It would be interesting to see the average age of the woodworker that purchases a cyclone (I am willing to bet the average age is over 50). I am a bit disappointed that the woodworking magazine (all of them included) don’t do a current review of cyclones. I bet it is because it would piss off some of the cyclone manufactures (as they are big advertising supporters). Would love to see a review of 2HP units and then another one for 3HP units. Well, one can only hope. Can you please send more pictures of the ducting and the connection at the ports. I too modified the ports on the jointer (from 4” to 6”) and the table saw (from 4” to 5” and added an overhead Shark Guard with 4” port). Currently I am adding an additional port to the band saw. Already comes with a 4” port at the bottom wheel. I am trying to build and add a second port under the table. Thanks again for the review and please send more pics. I have the same DC that I bought used, I installed it all by myself, this was a job. Thanks for the detailed review. I’ve gone a cheaper route to start HF / SDD. I’ll see in coming months’ if the upgrade from Rigid 1hp dust distributor was worth it. Thanks. I used 6” SDR-35 Sewer and Drain Pipe to complete the CV 1800 installation. I would think that my approach for transitions and machine pickups would work with metal pipe. I have 9 drops. Two go directly into the Dust Pickup for the machines with 6” Dust Collection Ports. The Radial Arm Saw Pickup that I constructed as best I could and the shop built Downdraft Sanding Table are straight 6” pickups. 6” smooth wall x .030 mil steel wire reinforced Polyurethane Flex Hose was used to make these connections. 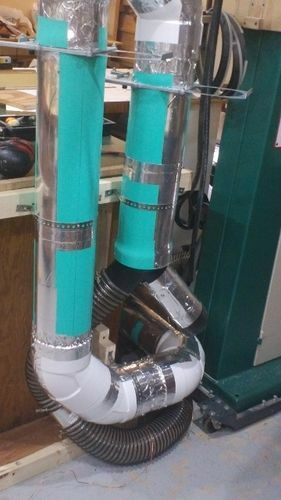 The Drum Sander received a 6” x 5” Reducer, and the 6” Flexible Hose made this connection the duct work. The remaining 6 drops were split into two 4” drops after the 6” blast gates. This 6” to dual 4” transition was made using 6” X 4” Dust Collector Adapters (6” x 4” x 4” wye). These bring the two 4” ports directly into the 6” end of the adapter. I did not use a 6” x 4” reducer followed by a 4” x 4” x 4” wye because I wanted to maximize air flow at this junction. I figured a 60% reduction in air flow had I reduced the 6” duct work to 4”. The 6” X 4” x 4” wye adapter (commonly used at a dust collector’s inlet to equip a 6” dust collector inlet with two 4” drops) reduces air flow by 10%. 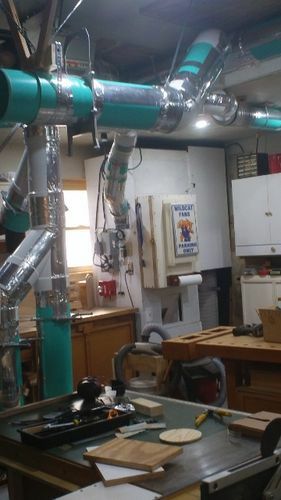 The 6” x 4” x 4” allowed me to connect two 4” flexible dust collection hoses to the duct work at one end, and to the dual 4” dust ports on the machine. As I may have mentioned in my review, I used a bimetal hole saw to drill a second 4” hole in machines that originally had only one 4” dust port. These machines were the Planer, Cabinet on the Table Saw, Shaper Cabinet. These were all metal. By the way, in doing this I ended up throwing the 4” hole saw and mandrel away. I could not release the mandrel from the hole saw. A bummer I know, but after just spending thousands of dollars on dust collection, what’s another $30 to replace the hole saw. I also cut a 4” hole in the plywood cabinet that serves as my Router Table, giving me table top and lower dust collection ports. I covered the freshly drilled 4” holes with 4” Angled Dust Ports. The 4” x 0.033” Flexible Hose I used is Clear Flex-Tube PU Polyurethane Smooth Walled Duct Hose. Both the 4” and 6” Flexible Hose can be bought on Amazon at a competitive (but high) price. The 6” x 4” x 4” wyes and the 4” Angle Dust Ports were made on ABS (I think) and from Grizzly. These fitting from Grizzly were inexpensive. I am sure that if you poke around on the internet you can find metal versions of these fittings. I used band clamps to secure flexible hose and applied silicone at the added dust ports. Here are some pics. I am new to Lumberjocks and a have yet to figure out how to post pics. If these do not turn out just right, I look into some other way to post these. The CV 1800 was outfitted with a Pitot tube so that the amount of air flowing out of the filter stack could be monitored and thus know when it is time to clean the filters. As the theory goes, when the filters are new and clean, air will be pumped by the dust collector out of the filters at the greatest possible rate. On the other hand, if the filters are completely plugged with dust and debris so that no air can pass though the filters, the air flow coming out of the cyclone is zero (in theory). As the dust collector is used and more dust plugs the filter, the air flow coming from the dust collector outlet is reduced. By measuring the reduction in the air flow emerging from the dust collector outlet, one can know when it is time to clean the filters. The Pitot tube is a cheap and a cool way to monitor the air flow emerging from the dust collector outlet. When a tube is placed in a fluid stream and perpendicular to the fluid stream, a vacuum is created in the tube. The fluid can be either a liquid or gas; in this case it is dirty air flowing out of the dust collector outlet. The faster the air moves across the end of the tube, the greater the vacuum. By placing water in the tube, the vacuum will pull the water up the tube toward the end of the tube in the air stream. The Pitot tube is a device that makes use of this principle of physics. It a U shaped tube containing water. One end of the tube is placed in the moving air stream. The other end of the U tube is open. When no air flows across air stream end of the tube, the water level in the U tube is the same height. As air flow across the end of the U tube increases, the water level rises in the leg of the U tube whose end is in the air stream. The water level in the other leg of the U tube drops. 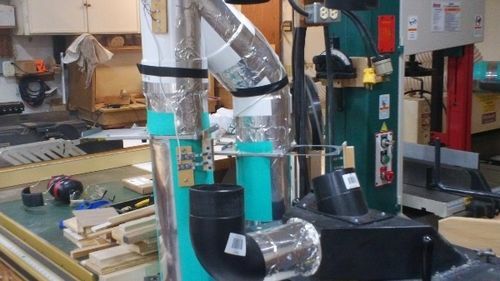 Should you decide to make one for your dust collector, Stumpy recorded a video where he takes you through the construction of a Manometer (Pitot tube). 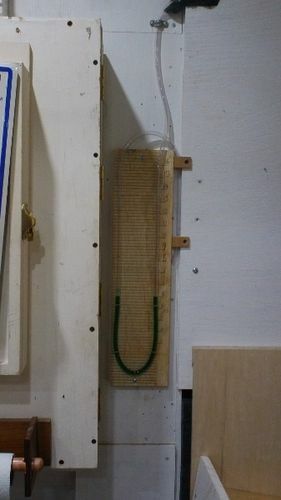 It is found at “https://www.youtube.com/watch?v=f92mDnLpWFU” and is entitled “SNW45- Woodworking dust collection upgrades- MAKE YOUR OWN MANOMETER filter monitor!”. The only deviation from Stumpy’s design was ensuring that the Pitot tube extends at least 1” into the exhaust air stream. I mounted the vinyl tubing to plywood that is 5” wide and 20” long. I drew a measuring scale on the plywood. I also colored the water and then used a funnel to fill the vinyl tube. I only filled the U tubing to the point where the water level was about 1/3 high. Ensure there are no kinks in the tubing. As time goes by, water will probably have to be added to the Pitot tube, but always fill to the same level more or less. Additionally, I ensured that 24” or so vertical distance was maintained from the top of the water level in the U tube and where the tubing enters the cyclone. The last thing anyone would want to do was draw water into the filters. Lastly test the system when installed. Turn the dust collector on while watching the water level. If it appears that water will be drawn into the dust collector, shut off the machine and empty out some water and try again. If you maintained the vertical distance I suggest and only fill the U tube by no more than a 1/3 there should really be no problems. In my case, the dust collector only pulls the water level up toward the collector by about 2-1/2” to 3”. Make a note of the water level with the Dust Collector running when the Dust Collector filters are clean. When the water level fails to reach this benchmark, the filters are becoming dirty. Alternatively, when the water level in one leg of the Pitot tube approaches the water level in the other leg, the filters are clogging. I suspect this differential measurement is the best measurement to track. I have not yet figured what the “time to clean” reading is. The measurement should be made with all but one blast gate closed. The open blast gate should always be the same blast gate when reading the Pitot tube. Air flow from different branches can and probably will give different readings due to static pressure inherent in each duct work branch. In the photo, tubing on the right enters the cyclone air stream. Tubing on the left loops around and end exposed to free air. Herein above and in your post, you mentioned that you installed HVAC duct work. I considered that option but was concerned about whether it would hold up or collapse. Since you did not mention it, I assume it does not collapse. 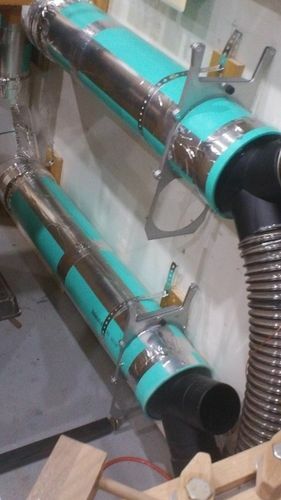 Did you use 6” 30 gauge HVAC pipe and fittings or did you go with heavier gauge duct work? I looked at your install at the link you provided above. I envy you. I wish I had a place out of the workshop where I could have put the CV 1800. Placing the machine outside would have freed up floor space and made it much easier to mitigate the noise. But that poses some challenges. First, the CV 1800 is pulling perhaps 800 cubic feet or more of air out of the workshop every minute the machine runs. That air must be replaced and you mentioned returning it somewhere near your wood burning stove, if I remember correctly. Did you pull in fresh air from outside or did you return air from the cyclone? How did you ultimately returned air to the shop? Second, in the photos in your post, you installed the filters. One advantage of placing the dust collector outdoors is that you can avoid the expense of the filters as well as their maintenance. Of course if you returned air to the shop from the dust collector itself, you need the filters. Since air containing only fine dust is deposited outside the workshop, why did you install the filters? Third, you mentioned in your post that you had a problem of sliding the dust collection drum under the cyclone funnel. I think you said the drum you had was too tall. For me, having maximum dust collection capacity was important. I do not like spending my woodworking time emptying the dust collection drum. How did you solve this problem? Fourth, when you take heated and moist air outdoors and that air hits cold surfaces, condensation can occur. Moisture can deposit on the motor, the MDF components, and make dust stick to surfaces. I assume you insulated the outdoor enclosure to prevent this. Has condensation been a problem and if so, how did you overcome that problem? Lastly and perhaps most importantly, your post was active until about September 2013. Have you had any problems with the CV 1800 since then? Regarding the problem on which you seemed to have given up – that of knowing when it is time to empty the dust collection drum, I have a suggestion if you have not solved the problem. I suspect that it is a real pain to leave the warm workshop during a planing operation only to find you have capacity to run some more boards. My suggestion is to construct a Dust Collection Chamber. This would be a sealed enclosure in which your Dust Collection Drum sets. The cyclone funnel penetrates the top of the chamber so that debris can be deposited in the Dust Collection Drum setting inside the Dust Collection Chamber. The Dust Collection Chamber would feature door to provide access to the Dust Collection Drum. The Dust Collection Chamber is sealed. While a Dust Collection Chamber itself does not solve the problem of determining when it is time to empty the Dust Collection Drum, it does provide a stable platform on which you can mount some type of Bin Level Sensing mechanism. That can be an optical sensor, camera, weighing device, viewing port with direct access into the shop, or something else altogether. The Dust Collection Chamber allows you to mount the sensors so that they are stable and outside the dusty environment where the Dust Collection Drum sets. Emptying the Dust Collection Drum would not disturb the sensing system and is very easy. I used 6” 30 gauge HVAC. 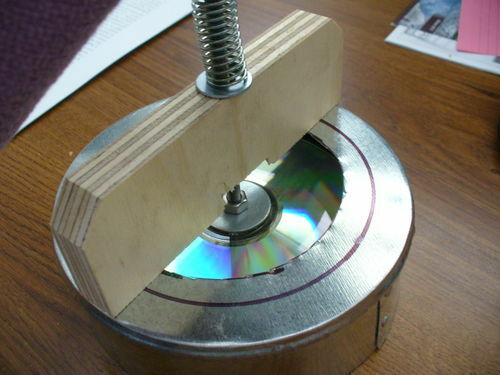 I used a end cap, a DVD , a threaded rod and a spring. When the vacuum is too great (all port closed) the valve open and it prevent the duct from collapsing. I tried to install the filters outside and to make a return in the shop, but I rapidly realized that this was impossible. a quick calculation told ma that to have an area sufficient for the return air, I would have to remove the whole wall. I moved the filters in the shop.This works well,the noise is very reasonable and I do not waste any heated or cooled air, in fact in the winter the air coming out of the filters is warm just due the compression of the air. I live in Utah, no condensation here. The DC outside is in an enclosed and sound insulated building to protect the neighbors from the noise. To empty the trash can has not be a problem, I just go check before I start to work and if necessary I empty it. In the winter I burn everything in my stove. I got it overfull a few times, then I just clean the filters.No big deal. MY only problem is self inflicted: because of room restriction just at the inlet at the DC I have a sharp elbow, which cause turbulence and a restriction and the vacuum is not quite as good as it should be. If I could have a 6 feet long piece of straight duct this would greatly help. If this was real issue for me I could fix the problem but this is not really a big issue as the suction as it is is enough for my needs.